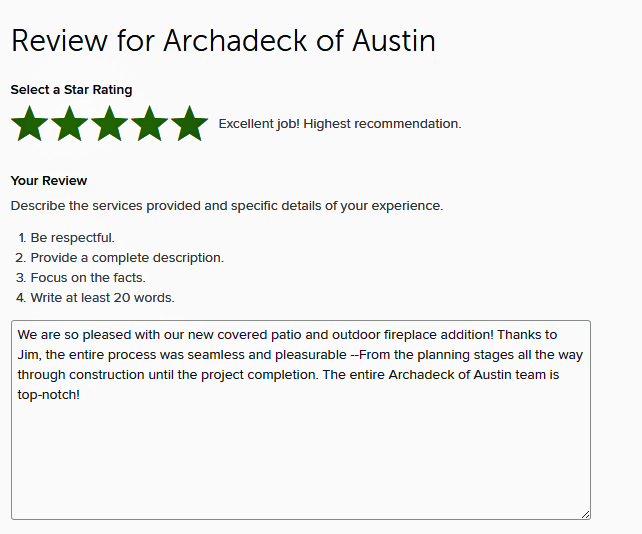 Archadeck of Austin strives to give each of our clients an experience above all others. From our custom designs to professional installation and superior customer service, we want to exceed your expectations. 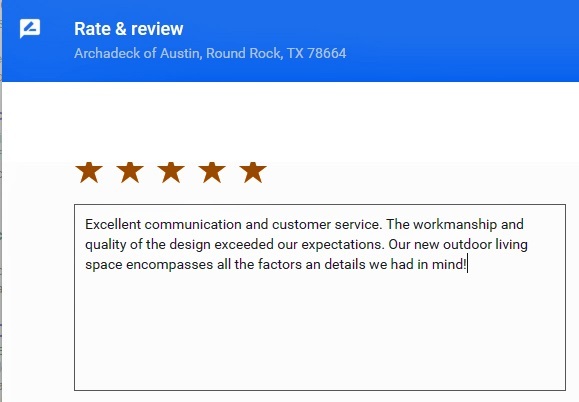 In turn, our customers refer us to their friends and family which gives us the opportunity to continue enhancing homes and backyards all around the Austin, TX, area. 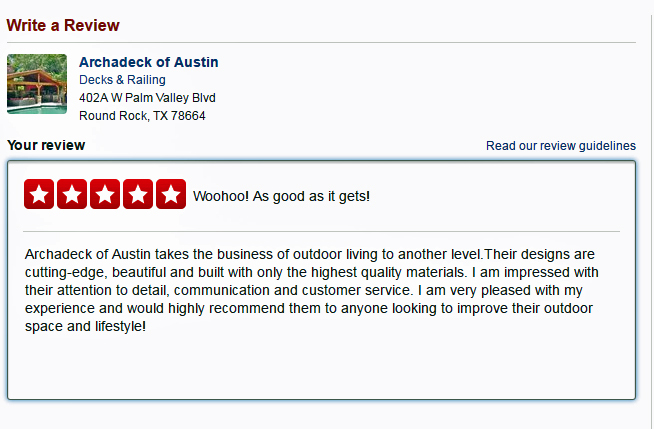 If you have a Houzz account, log in and click here to leave a positive review for Archadeck of Austin on Houzz. One Houzz reviewer wrote…I contacted 5 area businesses to get educated and to obtain a bid for an outdoor kitchen. Mr. Jim Odom, owner of Archadeck of Austin, was far and away the most professional, personable, experienced and responsive. His experience proved to be invaluable. His recommendations were solid. His explanation of all aspects of the process was right on target. His involvement in the project was greatly appreciated. He ran interference, even going so far as to make recommendations as to a color scheme that would go with our backyard. A totally outstanding experience from start to finish. We are ecstatic with the results. Our neighbors have expressed how this kitchen “completes” our backyard. Thanks Jim. Great job. Archadeck of Austin is an accredited business on the BBB. We are very proud of our A+ rating and would love a great review from you on the Better Business Bureau.